It might not be tenderloin or rib-eye, but in Chinese cuisine, it often doesn’t matter. PREMIUM cuts are desirable when preparing bigger chunks of meat. When you dig into that steak, you want it to be nice and juicy. 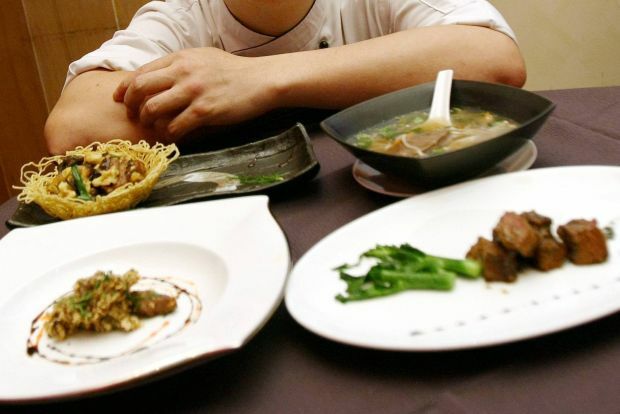 However, in Chinese cooking, the meat is usually bite-size so the choice of cut is not that important, says Lam Hock Hin, executive Chinese chef of Chynna at Hilton Kuala Lumpur. “Many guests think they have to order rib-eye or tenderloin. They think if you don’t use the best cuts, then the meat will be tough. But that’s not true,” he says. When prepared with care, non-loin cut meats can end up being just as good as loin cuts, Chef Lam maintains. According to him, Chynna doesn’t use sodium bicarbonate – an ingredient many Chinese restaurants use to tenderise meat – but opts instead for an oyster sauce or soya sauce marinate combined with flour, salt, sugar and pepper. “With sodium bicarbonate, the flavour and nutritional value of the meat will be affected. Australian beef and lamb are premium meats, and the different cooking techniques we use for Chinese cuisine allows us to use non-loin cuts. If I don’t tell you that the meat in my dishes is not a loin cut, you might not even notice,” Chef Lam says. This is a bold assertion, especially since we are being served four dishes from Chynna’s Red Majesty menu, which boasts six beef and six lamb dishes. We start with the clear Beef Soup, which has a slightly thicker consistency than most clear broths. It has Szechuan vegetables and enoki mushrooms, and slices of oyster blade beef that are still slightly pink in parts and firm. There’s no fancy garnishing, leaving the soup to stand on its own – and this it does, its taste a nice combination of licorice root, dong gui (angelica sinensis), chinese parsley, ginger, spring onion, shredded carrots and a dash of hua diao wine. “Beef and lamb are quite common in Chinese cuisine in China, Taiwan and Hong Kong, but we don’t use them as much in Malaysia and Singapore. Many chefs are not familiar with using red meat in Chinese cooking,” says Meat and Livestock Australia (MLA) representative for Malaysia, Singapore and Brunei, Ryan Au. With this in mind, the MLA launched its Red Majesty project, a culinary programme that commenced in May last year. It is aimed at introducing innovative Chinese recipes and improved cooking methods for Australian beef and lamb. Twenty-eight chefs from Malaysia and Singapore were selected to participate. “We trained them in how to use the product and flew them to Australia. The chefs also visited cattle farms and processing plants,” Au says. “At the end of the programme, the chefs will prepare a special menu. Chef Lam and Hilton will be the pioneers of this Red Majesty promotion,” he says. Au points out that unlike Western cuisine, Chinese cuisine treats meat as just another ingredient. In Argentina, the average consumption of beef is about 60kg a year per capita. “In Malaysia, it is about 5kg a year per capita. For a family of four here, 100 or 200g of beef is usually enough for a meal,” says Au. One of the highlighted cooking methods used in the Red Majesty menu is sous vide (pronounced soo-veed), French for “under vacuum”. This method requires precise control of timing and temperature. Chef Lam explains that a larger piece of marinated meat is sealed in an airtight bag and placed in a water bath in the oven and cooked at a low temperature until the core temperature of the meat reaches 42°C. “It is then taken out to rest for a while before being sliced or cut into cubes. For extra flavour, you can add salt and pepper to taste before searing it,” he says. The cubes of Sous Vide Beef Rump with Jade Kale in pepper mint sauce that we have is coated generously in a viscous dark brown sauce that boasts a complex burst of flavours. The meat is juicy and flavourful – tangy, sweet and salty all at once, with a hint of chilli and black pepper. I am told that this delicate balance of different ingredients and flavours is an important feature in Cantonese cuisine. “It’s all about the balance of flavours. Most people find Cantonese cuisine very palatable because it is relatively mild. Not too oily or spicy, not too strong,” says Chef Lam. The Stir-fried Shredded Lamb Rump with wood fungus and eggs served in a wantan nest perhaps best demonstrates this quality. It is tasty without being overwhelming, and the meat is tender. It’s a feast for the eyes as well, with the bits of lamb, shredded cloud black fungus, tomatoes and spring onion arranged in the golden-brown crispy wantan nest, garnished with alfalfa and wolfberry. Next is the Wok-fried Lamb Rump Slices with Xin Jiang cumin, oats and Chinese parsley. The lamb slices are first seared in the wok and set on the side, while the cumin is sautéed with chili powder before all the ingredients are tossed together. The taste is rather distinctive, thanks to the sautéed cumin, while the oats lend a delicate, toasty fragrance to the meat. Chef Lam confides that the major challenge in having red meat on the menu is convincing sceptical diners. Many worry that the meat will be tough. But vacuum-packed and air-flown from Australia, the meat actually starts to tenderise early. “Vacuum-packing over a period of time not only keeps the product fresh but also helps tenderise it due to a naturally-occurring enzyme in the meat,” says Chef Lam. If the preview dishes we have at Chynna are representative of the Red Majesty menu, then texture and taste should be the least of your worries. Everything is tender and succulent, and most of the dishes, as befits a proper Chinese meal, go very nicely with rice. The Red Majesty promotion at Chynna, Hilton Kuala Lumpur, will run until Jun 30. Visit www.life.hiltonkl.com/dining or call 03-2264 2592/96 for enquiries.